There are 400million registered users worldwide, and 60 million photos are shared daily. It is currently the top social network for teens, and over 50% of people aged 18 – 29 years use Instagram. The gender split is near enough 50/50. Instagram has collected over 300 million users in just three years. Instagram is huge, especially if you’re looking to target under 30s. There was a little bit of confusion in the room as to what Instagram was, so here is my best explanation of Instagram, and how you can use it to promote your business or venture. Instagram is a photo sharing site. It is a rolling news feed like Twitter, but with images. Instagram is all about the image. You can use hashtags like on Twitter or Google+ and find photos in the niche in which you are interested. You can like photos by pressing the love heart under the pic, or comment. You can also tag other people using a @ like on Twitter. You can register and log-in with Twitter or Facebook so you don’t have to remember multiple log-ins. You can also link up your account to Twitter or Facebook and it will cross-post images to these networks. Instagram is predominantly a mobile app. There are things you can do on a PC but the posting of photos is usually done on a tablet or smartphone. The idea of Instagram is that it is instant. You can get away with posting photos later. Some people use the hashtag #latergram but it’s not compulsary! Instagram is a great place for #selfies! You can make your picture prettier by applying one of the suggested effects and filters, though the trend recently has been for more naked, non-edited images. Instagram will also support short video clips with sound, which can be quite fun, but don’t necessarily attract more engagement than a 2D image. You can make a collage of a few pictures if you want. You need to download a separate collage app for this. The one I use is called Layout and is free. You can’t ‘retweet’ an image as such but you can ‘regram’ using a separate app. Regrams don’t account for as many images on Instagram as much as retweets do on Twitter. You can use Instagram to promote your business. If you’re smartphone savvy and do something even vaguely interesting, then you can use Instagram to give customers an insight into what you do. 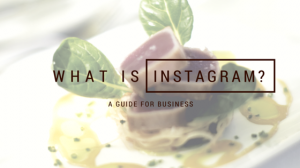 If you are a business that deals with animals, food, interior products, art, property, or anything visual, then you could do very well on Instagram. Seek out relevant hashtags for your niche. Follow people you want to engage with, whether this is on an industry level, or geographic. Have a look what hashtags they are using to see if you can use those too, but never hijack a hashtag – you should always make sure it’s relevant to your image. Take the time to go through your timeline every now and again, and like photos, and leave comments where appropriate. Have a look and see who else is liking and commenting and follow them too. There aren’t really any hard or fast rules to how often to post as a business, but as a starting point I would recommend you try and post at least one photo a day and no more than four. You should space photos out where possible to maximise your chances of receiving engagement. You can pay to promote your images on Instagram. I have no idea how much this costs and whether it is worth it. Look out for sponsored or promoted images in your timeline to get an idea of how other companies approach it. Top tip – you can use Instagram to bulk up your Twitter feed and make it more visual by setting up a ‘recipe’ on IFTTT. This means that the image will post as a Twitter image rather than a third-party link back to Instagram and looks a lot better for Twitter. Be warned though, IFTTT will faithfully send all your images from Instagram to Twitter, whether you wanted that particular image shared on Twitter or not. Saves time though if you find yourself regularly pressing the ‘share to Twitter’ button after posting on Instagram. Do you use Instagram to promote yourself or your business?